When we come in in the morning, we do the same thing every day. We check in and let each other know how our engines are running. Sometimes we are feeling tired, some of us are ready to learn, and if we are in the yellow or the red, our engine is running too high. Mrs. Cassell showed us the video “Be More Dog”. Mrs. Cassell said she saw this video at a workshop about blogging and using Twitter by George Couros. After we watched the video Mrs. Cassell asked us a question: What was the message in the video? 6. Sometimes we just don’t try things because we don’t know what will happen. The BIG message is to TRY NEW THINGS – especially if you’ve never tried them before. I LOVE that your teacher showed you this video and I am really inspired by your comments! I am going to show this video to my class as well and I am excited to see what they think is the message in the video! Thank you Busy Bees for sharing all of your thinking! 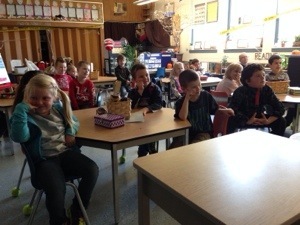 The Team 2 Eagles just read your blog to see what you thought of the ‘Be More Dog’ video. Cayden thinks that the message is to do something you’ve never done in your life. Preston says it means that when you are scared it’s good to try something too. Brian says: Try something! You might like it! We all would like to be more dog! We watched the video more than once, and I expect that many students will visit your blog later just to watch it again. Today, we acted more ‘like dog’ because we tried lots of new foods. We were excited to try the foods and found we liked some. You could maybe watch our video about trying the new foods and be courageous like we did to try something new. You should be more ‘dog’ too. Thanks for writing!